There are certain things that only ladies do when they hang out with other ladies. *I’m fairly well read, but Anna Karenina is not a book I’ve ever read. I’ve seen the Keira Knightley movie version though, so that’s how I know this. And, I’ve seen a Pulitzer Prize winning play about the book…sort of. I’m so fancy. You already know. Anyways, book club is a ladies occupation for ladies. And this lady (me) hosted her lady book club a few weeks ago. My friend Nora started the whole book club and, well, I’m glad she did. We’ve read a book I’d heard of but hadn’t gotten to yet (Gone Girl by Gillian Flynn) and read a book that I hadn’t heard of but boy, did it make me cry in the airport (Wave by Sonali Deraniyagala). But the most recent book club, I hosted. So, I choose the book. It was One More Thing by B.J. Novak (no relation) and it was hilarious. It’s a book of short, humorous essays. Some were dry. Some were almost poignant. But, boy, did they run the gamut. It’s well worth a read. OR, if you’re doing a long car trip, it’s worth downloading and listening to. He’s got an incredible cast of voices like Mindy Kaling, Jason Schwartzman, Rainn Wilson, Emma Thompson, Jenna Fischer and more. So, what to make for a lady event for ladies? Well, I like the tortilla española. 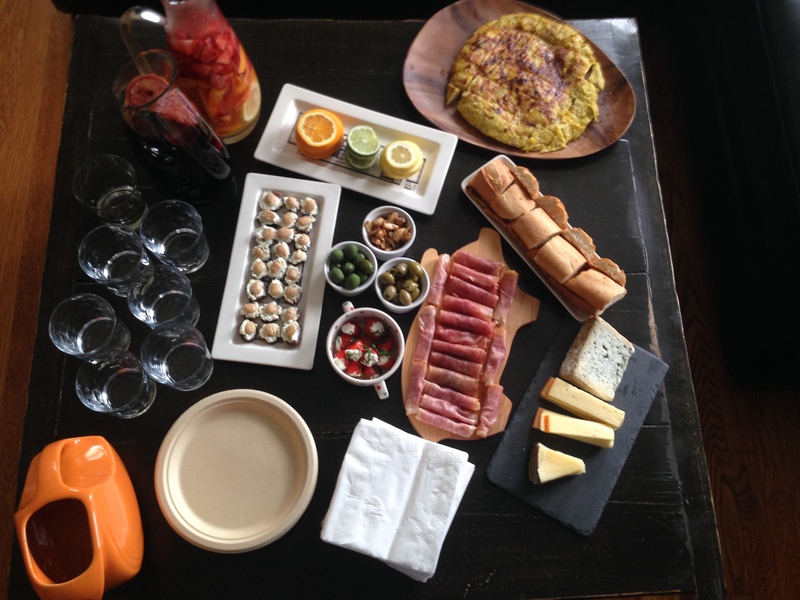 Why not build a tapas menu? Also, please note, this is a drinking book club, so boozing required. Jamon serrano because I cannot find ANY jamon iberico here in America. SIGH. The apricot and goat cheese bites were the newbies here and #realtalk, they were delicious. And unbelievably simple. Make them right now for whatever lady event you have. I bet even boys would like the salty-sweet combo that they have going on. Beyond that, sangria is a perfect summer drink. It’s bright and fruity, but has a boozy punch. I gravitate toward the white versus the red, but the red is a much more robust beverage. I guarantee. This menu? Ladies love it. Girls adore it. Y’all should trust me because I’m not internationally known, but I’m known to rock the microphone. Mix together the cheese and milk with a fork until spreadable. Thin with more milk if necessary. Add the basil and mix until evenly distributed. Spread a heaping 1/4 teaspoon cheese on each apricot and top each with an almond. Drizzle with honey. Please note! If not using marcona almonds, substitute roasted salted almonds (the salt is key to the appetizer’s flavor).